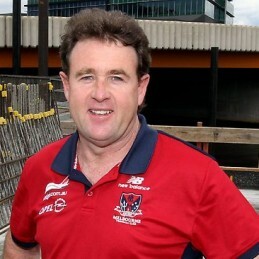 Chris Connolly played 84 games for the Melbourne Football Club between 1984 and 1989 before making a name in the coaching arena. He began coaching the Eastern Ranges in the TAC Cup from 1991 to 1995 before moving to the Hawthorn Football Club where he served as an assistant coach from 1996 to 2001. At the end of 2001 Chris was named the head coach of the Fremantle Football Club. At the time, Fremantle was in disarray both on and off the field. The club had won only two games in 2001 including 17 losses in a row and the wooden spoon. The club had a loss of $2.5 million and was $8 million in debt. There was a need to rebuild the football department and establish on field credibility. Chris developed a skilled and accountable group players that lead Fremantle up the ladder and into a success story. In 2002, Chris’s first season at the helm, saw the club’s best season in many years and the development of a strong home ground advantage. The club made finals for the first time the following year. In 2005 the club was profitable and debt free with a full sponsorship portfolio, over 30 thousand members and regular sellouts. An in-demand corporate speaker, Chris delivers motivational and down to earth presentations drawing on elements of success with a good dose of humour. Chris bridges the gap between the business and competitive sporting worlds. His infectious good nature leaves audiences in stitches. Chris is currently the Football Manager of the Melbourne Demons where he delivers coaching and leadership skills to a young group that is bound for success.